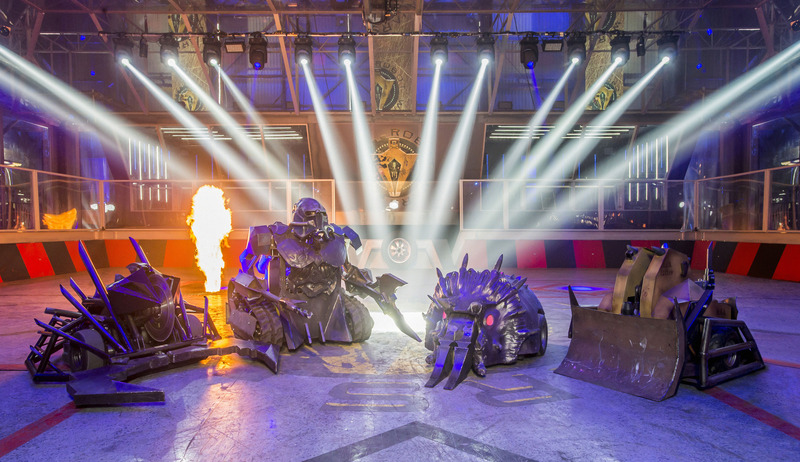 Not going to lie here, this season of Robot Wars rather snuck up on me, I found out that it was coming back on the day it aired so I had a lot of hype to cram in to a few hours, but it’s all good. After last season was heavily advertised on the back of how awesome the rebuilt House Robots looked it must be said that their involvement in the autumn season was rather minimal, confined rather strictly to the corner patrol zones (CPZ) with no means of traversing between them. In the second season the producers included a narrow perimeter patrol zone in between the larger corner areas that meant the House team presented a much bigger threat. In addition, they’d be set free to do far more terrible things to immobilised fighters, sadly no longer the case, although it does make repair time a little easier on the builders. The mechanic is fairly obvious, especially when you only have two competitors. If the edges of the field are dangerous to occupy it forces the fighters into close proximity and within range of the other hazards. It makes the whole thing more exciting, rasing the spectacle, and it makes Robot Wars an actual conflict rather than a prolonged chase scene between well-armed remote control cars. Limiting where the House Bots could be rather opens some of the arena for weaker or faster bots to hide in, allowing them to rove between them made it far more interesting, so why not reintroduce the Perimiter Patrol Zone or something similar? Ok, so we have a new game mechanic that lets the producers save some money and keep things interesting. The tire that can be rammed to activate the pit now has a chance to instead release a House Robot out for a few seconds, letting it run wild and cause havoc, putting the proverbial cat among the pigeons as it were. Now, if the first episode is anything to go by, results are inconclusive. It seems like the first round of fighters are reluctant to open the pit, maybe not to risk releasing Matilda, who opened the new season by taking out Nuts 2 with a rather graceful flick of her flywheel. Shunt made a brief mess of Terrorhurtz, rather finishing what Sabertooth started by devouring the axe-wielders insides with one good shot with it’s spinning drum, but to be honest there wasn’t much competition for Aftershock, who’s flywheel served long-time loser turned heat-finalist up to Sir Killalot to hold over the firepit like a crunchy marshmallow. It’s only heat one, things are already interesting, and no doubt we’re seeing more of Matilda, Killalot, Shunt and Dead Metal, but the new regulations on what the competitors are now allowed have made for some terrifying new fighters. Apollo hefted the giant House Robots aloft without much effort, Carbide’s howling weapon devastated some crowd favourites, Thor making a mockery of Aftershock’s predecessor Shockwave (only for Shockwave to turn it around on them), the very arena torn to chunks. It’s been years since the shock of Razer pulling Matilda to pieces, and the absolute power of the House team has been constantly undermined as time has gone on. This entry was posted on March 7, 2017 by terraphi. It was filed under Entertainment, Television and was tagged with 2017, BBC, Dead Metal, House Robots, Matilda, Robot Wars, Shunt, Sir Killalot, Television. I felt Rebellion hasn’t been shown off the best it can, during one fight it seemed like Shunt was doing all the work whilst Dead Metal just sat there, twiddling his claws. Week 5 from the website, alongside another robot that looks absolutely insane.